Hanoi (VNA) – Vietnam’s manufacturing sector continued to expand during January-March with signs of higher growth in March, according to a report from IHS Markit. 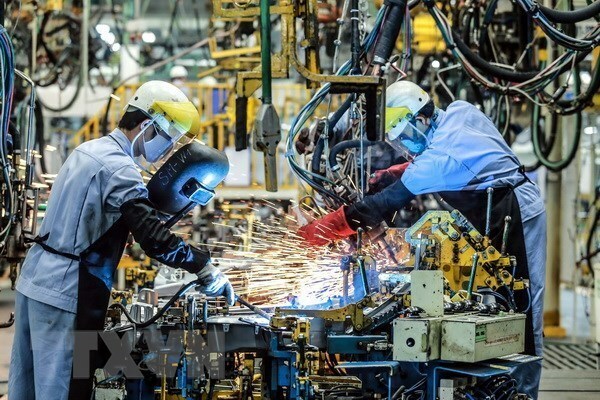 The Nikkei Vietnam Manufacturing Purchasing Managers’ Index (PMI), a composite single-figure indicator of manufacturing performance, posted 51.9 points in March, up from 51.2 in February and signaling an improvement in the health of the sector for the 40th successive month. Although registering below the 2018 average, the PMI was comfortable above the 50.0 no-change mark at the end of the first quarter. The sector saw its March output increase at the fastest pace since November last year while total new business and exports also rose more quickly than in February. However, employment continued to decline marginally. Meanwhile, the rate of input cost inflation remained relatively weak, providing scope for firms to lower their output prices. New orders rose for the 40th month in a row during March amid increased customer numbers and growth of new export business. Moreover, the rate of expansion in total new orders was the fastest in three months. The rate of growth in manufacturing quickened for the second consecutive month, and was slightly faster than that seen for new business. This enabled firms to reduce their backlogs of work and add to stocks of finished goods. The increase in output was recorded in spite of a slight reduction in staffing levels in March. Panellists suggested that employee resignations had hampered their efforts to expand workforce numbers in response to greater workloads. As has been the case throughout 2019 so far, inflationary pressures remained muted in the sector at the end of the first quarter. Input costs rose marginally and at a pace that was well below the series average. This lack of pressure on costs meant that firms were again able to offer discounts to customers. Charges decreased for the fourth consecutive month, albeit fractionally. Vietnamese manufacturers responded to higher output requirements by increasing their purchasing activity sharply, with the rate of expansion the fastest year-to-date. Stocks of purchases decreased, however, as inputs were used to support production growth. The fall in input inventories was the second in as many months. Meanwhile, suppliers’ delivery time was shortened for the first time in over two years, following broadly unchanged vendor performance in February. Almost half of all respondents to the latest survey predict output to increase over the coming year. Strong optimism reflected expected improvements in market demand and investment in expanding productive capacity. These factors are forecast to help firms meet their plans for higher output. Confidence in March was higher than in February and broadly in line with the series average.